Having toiled over correct tip sizing with different manufactures I stumbled across this article while getting a Kremlin set up for a customer the article answered my questions clearly and concisely so rather than spending the time to re write Phil’s article I decided to plagiarise it completely (with permission ) and give the credit where credit was due. Choosing the correct tip and gun set-up for your spray equipment can be very confusing. The overwhelming number of tip sizes, set-up options and differing nomenclature between the equipment manufacturers often leads to finishing problems as a result of using the wrong size of tip. U.S. manufacturers often use thousandths of an inch to designate the size of the tip. However, many U.S. manufacturers also use millimeters to classify tip size on some of their equipment. This is especially true when specifying HVLP spray gun set-ups. Other non-U.S. manufacturers use millimeters and other types of nomenclature that does not refer to either millimeters or thousandths of an inch. Here are some of the common nomenclature definitions used for some of the spray equipment manufacturers that are used in the wood finishing industry. Graco air assisted airless tip sizes: A “512” tip is read as if the first number (5) is doubled to equal 10, which designates the spray pattern width of a minimum of 10 in. wide at a distance of 12 in. from the end of the tip. The second and third number – or in this example, the 12 – represent the tip opening size as 0.012/in. Therefore, if your tip is a “614” number, it would be a 12-in. fan pattern and a 0.014 tip opening. Graco HVLP and conventional guns are designated as either millimeter or thousandths of an inch or both on the gun set-up size. Kremlin air assisted airless tip sizes: A “09 -114” – the first number of “09” designates the orifice opening size of the tip, however, the “09” does not refer to either thousandths of an inch or millimeters. It is a numbering system that Kremlin uses to define the orifice size opening. A “06” number is a smaller orifice opening than as “09”. A “12” tip would be larger than a “09”. A “06” equals approximately 0.011/inch. A “09” equals approximately 0.013/inch. A “12” tip equals approximately 0.015/inch. The second set of numbers after the dash refers to the fan pattern width in degrees of arc. A “114” equals 114 degrees of arc in the width of the fan pattern. Therefore, a “94” will be narrower than a “114”. A “134” will be significantly wider than a “114”. Kremlin HVLP spray gun nomenclature normally uses millimeters to designate tip sizes. Therefore, a 1.0mm tip will be smaller than a 1.5mm. Binks air assisted airless tip sizes: For a “114 – 01310”, the “114” designates a standard flat tip. The first three numbers after the dash (“013”) equals thousandths of an inch or 0.013/in. in this example. The last two numbers, or the number “10” in this example, designates a fan pattern width of 10 in. at a distance of 12 in. from the end of the tip. If the tip starts with a “9 – 1311F”, the “9” and the “F” designate that it is a fine finishing tip with a pre-orifice. The tip would have a 0.013/in. orifice opening and an 11 in. fan pattern at a distance of 10 in. from the tip. Binks HVLP spray gun nomenclature uses gun set-up numbers that must be referenced from their literature to determine their size. Most often they will be referenced with both millimeter and thousandths of an inch. DeVilbiss standard spray guns, HVLP guns and trans-tech guns use millimeters to define the size of the tip and gun set-up. What size tip is right for your application process? Tip sizes will vary greatly, depending on the types of material sprayed, the viscosity of the coating, how much material needs to be applied (flow rate), whether it is pressure-fed, siphon-fed or gravity-fed and whether the application is manual vs. automatic spray. For very low viscosity spray-to-color stains using HVLP gravity-fed spray guns, a 1.2mm to 1.4mm tip will work well. For pressure-fed HVLP guns spraying spray-to-color stains, a 1.0mm to 1.2mm set-up will normally be the range used for tip size. If you are spraying the same material with automated spray HVLP, a 0.08mm to 1.0mm tip size is recommended. For spraying spray-to-color materials that are slightly higher in viscosity, such as a shader, an HVLP gun normally will work well if the tip size is increased by 0.2mm to 0.4mm for all of the above technologies. Wiping stains spray best with air assisted airless technology. We recommend using a 0.06 to0 .094 tip size for Kremlin equipment; for all other manufacturers, a 0.28mm or a 0.009 tip orifice size will be adequate. An 8-in. 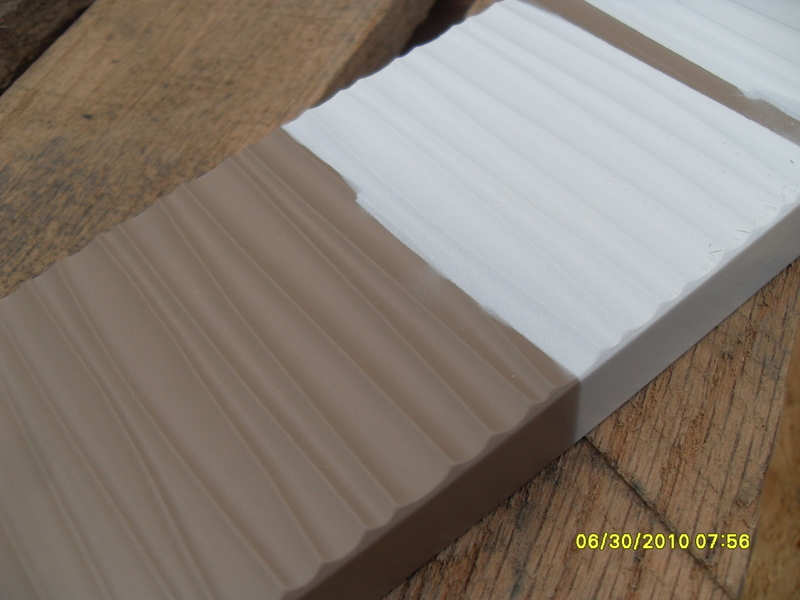 fan pattern width is an average size for applying wiping stains. Larger or smaller pieces require a larger or narrower fan pattern width. For solids, sealers and clear coats, an air assisted airless gun is recommended. Tip orifice opening size should equal around 0.013/inch. For Kremlin, this would equal a “09” tip. Pattern width of the tip generally ranges from 6 to 12 in. depending on the width of the parts. A wide fan pattern will often provide a more uniform coat with less runs and sags; however, a narrow tip will ensure higher transfer efficiency on narrower parts. Therefore, an average tip size for Kremlin would be a “09 – 114”; for Graco, a “513”; for Binks, a “114 – 01310”. For heavy bodied primers and glazes, a 0.015 tip or larger on an air assisted airless gun will generally provide a flow rate necessary for these materials. For Kremlin, this would equal a “12 – 114”; for Graco, a “515”; and for Binks, a “114 – 01510”. For water-based coatings, use the tip and gun set-up recommended by the equipment manufacturer that is specifically designed for water-based materials. These guns and tips are specifically designed to spray water-based coatings without causing shear on the material. We would recommend that you start with the same tip sizes for solvent-based coating. If you are experience problems with micro-foam or bubbles in the finish, you may need to try a larger or smaller tip on a trial and error basis to insure the best result is achieved with the type of water-based coatings you are using. Not all water-based materials are created equal; therefore, an exact recommendation for these materials cannot be offered. Does the stain have a heavy load of pigment? If so, a larger tip may be required. Is the stain made with only dye colorants? If so, a smaller tip may be best for this type of stain application. The solvent package of the coating: what is the solvent blend composition and does the material have a fast or slow flash-off rate? This will influence the tip size and gun set-up. Viscosity of the coating: a larger or smaller tip may be necessary to most efficiently apply the coating depending on the density of the material. The speed of spray application: Always try to select the tip that delivers the correct amount of material for the speed of application while maintaining the desired finish quality. If you choose the correct tip size for the job, your finish will look better, you will reduce rework, will experience of spray operator comfort, and will increase the efficiency of the coating application.